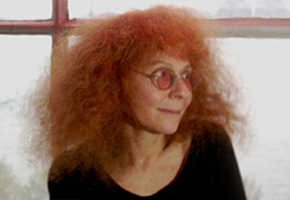 A native New Yorker, Barbara Rosenthal is a prolific, idiosyncratic, highly original Media and Performance artist, referred to in print as “Media Poet” in The Village Voice and elsewhere since the 1980s. She produced her first Performance/Installation in 1968, and Photography/Video in 1976, often mixing her Surreal Photographs with her texts, and such works are in the collections of MoMA, Whitney, Tate, etc. Eryk Wenziak is Editor-in-Chief of rIgor mort.US, art editor at A-minor Magazine, and art director at A-minor Press. His poetry has appeared in numerous journals, including elimae, Used Furniture Review, HOUSEFIRE, Connotation Press, Psychic Meatloaf, and Short, Fast, and Deadly. He has published four chapbooks: 4am, a visual poetry collection published by No Press (Canada); 1975, an experimental poem published by Deadly Chaps (US) which was nominated for a Pushcart Prize; Status Programs | Some Rules For Us To Break, a collaborative writing effort which utilizes Facebook to generate the output of poetry; You are my anti-spam hero, a collection of spam-email subject headings published by Twenty-four Hours Press (US) and also nominated for a Pushcart Prize. Mo Baretta is a Brooklyn based artist. She studied landscape architecture, fine art and graphic design at Colorado State University. She has an extensive and dynamic show portfolio with solo gallery shows and collaborative shows nation wide. Mo’s visual art is based on the premise of the Divine Feminine and exposing the limitless potential of the human spirit. Her imagery is of the empowered, strong and spiritual Goddess, Warrior and Creator Archetypes. She works to portray the power that we hold to embrace our darkness while illuminating our inner light, while simultaneously juggling the dynamic and powerful struggle between the world within and the world without.